Nationally, Mankato has the second lowest unemployment rate, as reported in CNN Money! The Greater Mankato regional marketplace includes Blue Earth and Nicollet counties and the communities immediately adjacent. Each of the communities and counties in Greater Mankato has its own unique strengths, which together combine to create a robust portfolio of regional assets. Catch all the business insights in Greater Mankato. Greater Mankato is a regional leader in employment growth. What’s happening? Where do we begin!? 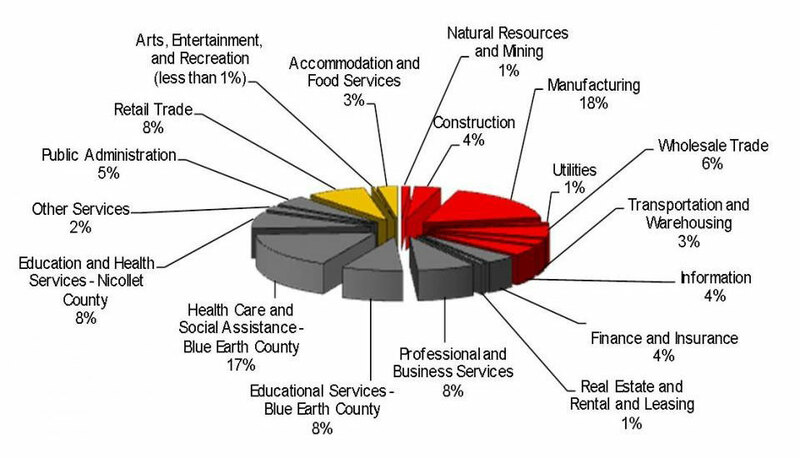 Mankato’s general economic make-up is highly diversified, with approximately 36% Primary Economy, 53% Professional/Service Economy and 11% Retail/Consumer Economy. Even within these areas, the economy is diversified, with no sector accounting for more than 18% of the overall economy. Greater Mankato Growth, Inc. along with hundreds of businesses and professionals rooted in agriculture from across the region have been working since 2013 to strategically build and connect the region’s extensive agricultural business assets in order to position this region to be known as the place for talent, business, innovation and education in relation to agriculture. Put a face with the name. Let us find your answer. Contact our staff today!